Nothing satsifies a sweet tooth like fried dough. These Mexican Churros are crunchy crispy on the outside and soft and chewy on the inside just like they make 'em on the street corners in Tijuana. I've added a twist to the flavor profile with just a hint of lemon. 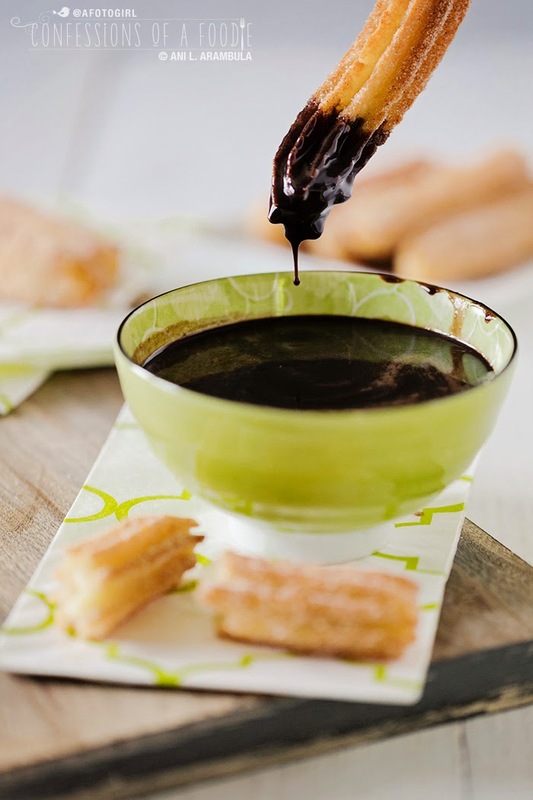 Try them the Spanish way - dunked in dark a luscious dark chocolate sauce. Nothing satsifies a sweet tooth like fried dough. 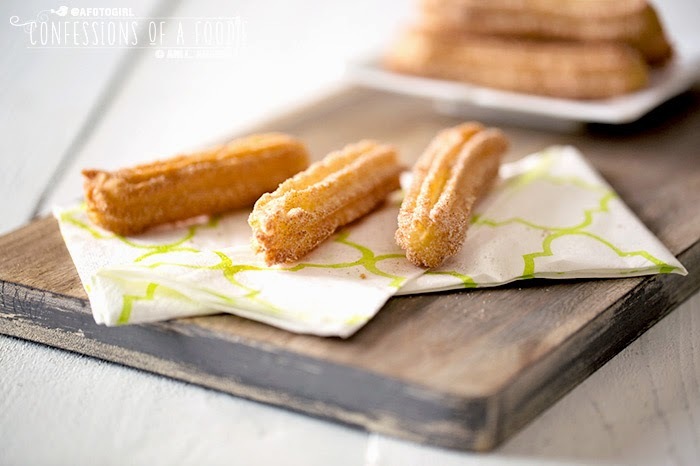 These Mexican Churros are crunchy crispy on the outside and soft and chewy on the inside just like they make 'em on the street corners in Tijuana. I've added a twist to the flavor profile with just a hint of lemon. 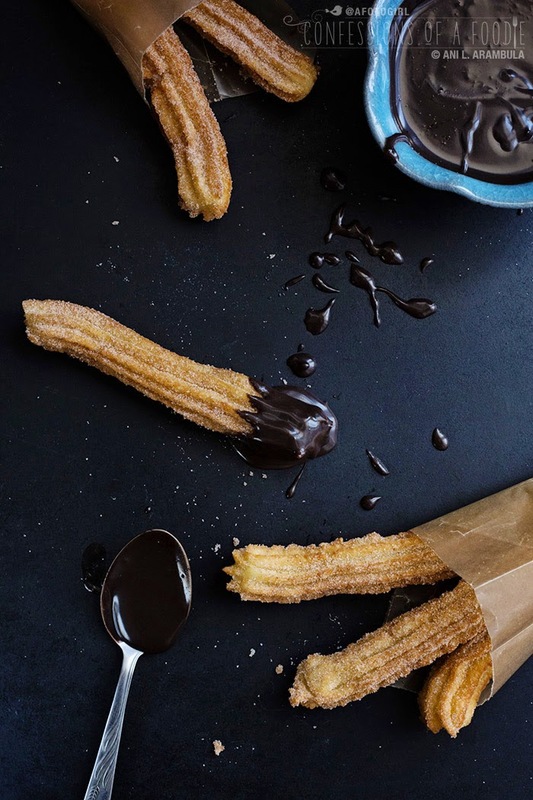 Try them the Spanish way - dunked in a luscious dark chocolate sauce with just a bit of heat. Exactly when it was the first time I bit into a churro, I can't say. I do remember being preschool age and taking occasional trips to Tijuana (TJ) with my parents and grandparents to shop and bring back kilos of fresh corn tortillas (nowadays, in almost every neighborhood in San Diego you can find a tortillaria but back then, you pretty much had to go across the border for them). The best part of those trips for me was heading home because that meant a wait in long lines at the border crossing with guys carrying huge brown sacks filled with hot churros walking up and down those lines hocking them to the Americans waiting to get home and me saying, "Mommy, can I have a churro?" which of course, I always got. Also, I remember one time when I was young I was spending the weekend at Grandma & Grandpa's house and Grandpa made churros for us. I couldn't have been more than 6 or 7 years old and I don't remember him making them again. But, Oh! do I remember that time and I remember thinking he was really smart because he could make them just like those guys selling them in the streets in TJ. As a pre-teen and teenager, my family would make a day of it shopping and site seeing in Old Town San Diego. We could not leave without stopping at the bakery for freshly fried churros and traditional Mexican candy. It seems lately that more and more places are selling churros. Rewind. They're selling poor imitations of what are passed off as churros to unsuspecting tourists. At the local mall, a store sells nothing but churros that have had their creamy doughy centers replaced by overly sweet fruit flavored pastry creams and custards. Ack! Even a few fast food places are selling "churros" but they're nothing more than desiccated excuses for a fried stick of dough that they try to salvage with sugar and cinnamon. Ick! I don't partake of fried dough often. Adult me feels way too guilty to take in all the calories. So when I do indulge, you better believe it when I say the treat better be good and worth it. 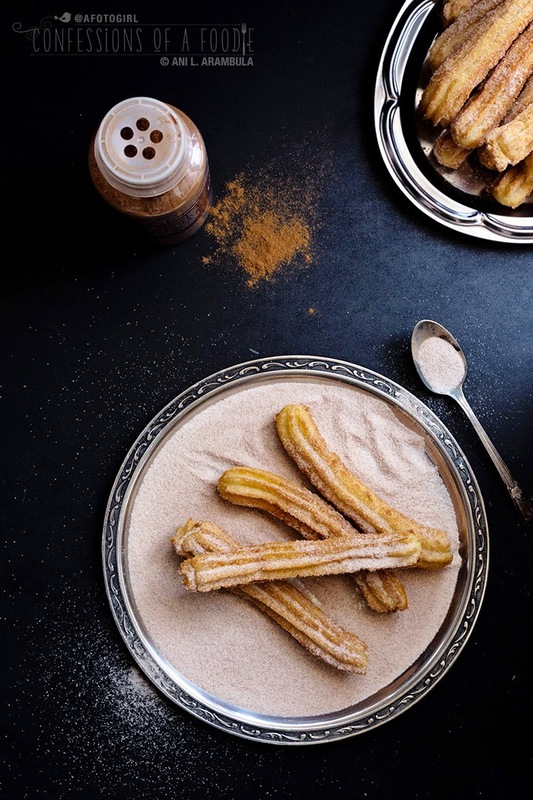 Although churro dough is made very similarly to a pâte à choux that is used for a lot of French pastries such as cream puffs, éclairs, beignets, and French crullers, there is a crucial difference: pâte à choux uses butter and eggs while churro dough does not. You'll find a lot of "churro" recipes on the 'net that include eggs and or butter. But the consistency and texture is very different. I think it's why some of those restaurant attempts at churros wind up so desiccated after a few hours hanging out. 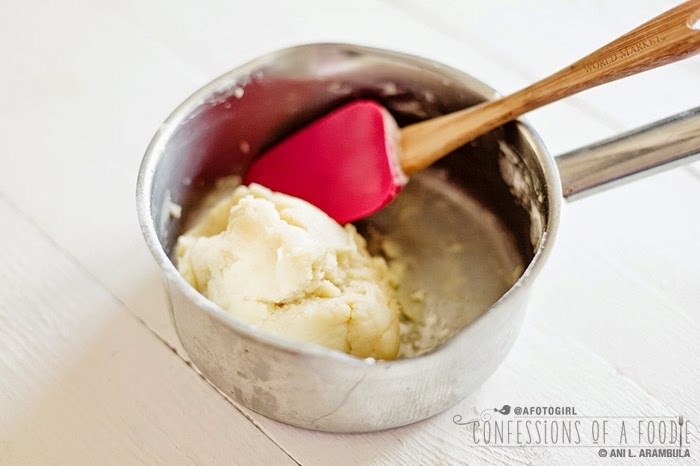 The butter and eggs produces a light, very airy dough with lots of holes. In contrast, a good churro should be crispy and golden on the outside and chewy and dense and creamy on the inside (some might think it's raw but it isn't; it's not supposed to be cake-like either). No eggs. No butter. 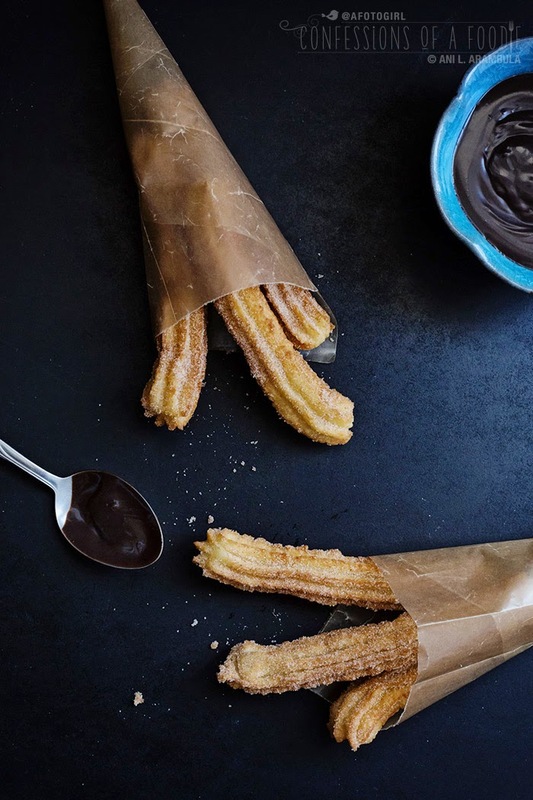 If you want the light airy texture, then churros aren't for you. Make a traditional pâte à choux and fry up some beignets. Or French crullers. 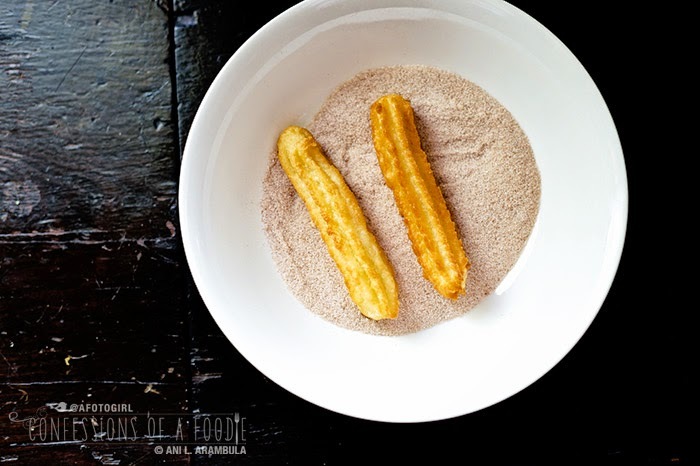 But if churros are what you're craving, read on and give 'em a whirl. Let me know what you think in the comments or on the 'Confessions' Facebook page if you do. I'd love to hear how it went. I watched a show in Spanish earlier this year. My Spanish is such that I catch maybe every third word. Enough to get the general gist of the conversation. My grandmother will attest to that. Anyway … It was an interview with a cafe owner in Spain and she made churros. 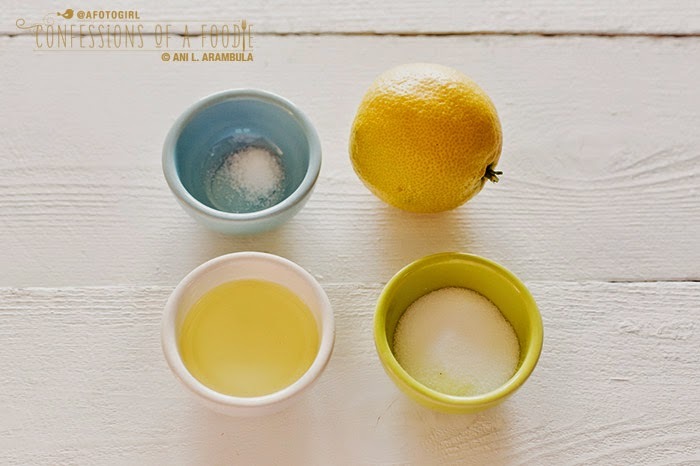 She added lemon zest to the simple syrup. Genius! I remembered thinking. Must try. And I did. And it's just a little hint that brightens this simple dough and it goes great with the chocolate sauce. Feel free, though, to skip the lemon. These are still tasty without it. You're going to need a heavy bottomed deep pot such as a Dutch oven to fry these babies up. Also, I experimented with variations (my coworkers were quite appreciative!) and depending on the size tip I used, the yield varied. For this batch I used an extra large closed star tip but I've also used an extra large open star tip . The open star will yield less than the closed star. You can also forgo a tip altogether and just snip the end of your disposal pastry bag (or gallon sized resealable plastic food storage bag). Personally, I like the traditional ridges that a star tip gives churros. This recipe is a doubled version. I figured, if you're going to use a liter of oil to fry, you might as well make enough to share. However, feel free to half this recipe. 1. Pour water into a medium sized saucepan and place on medium heat. Add sugar, salt and zest and oil. 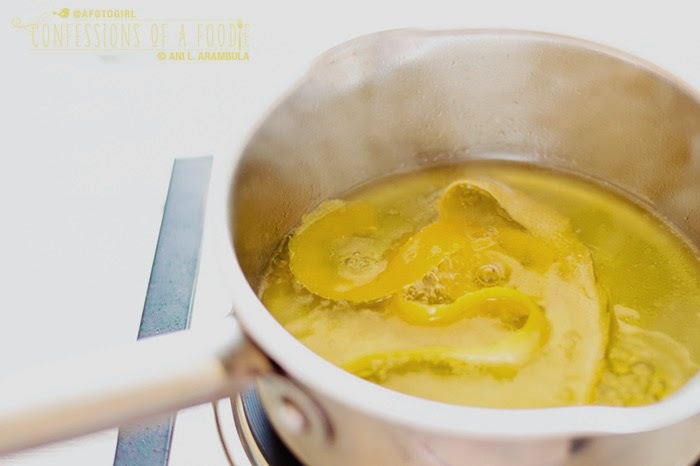 Stir to combine and bring to a quick boil, then reduce heat to low and simmer for an additional 2 minutes to allow lemon zest to release it's oils. Remove lemon zest. 2. 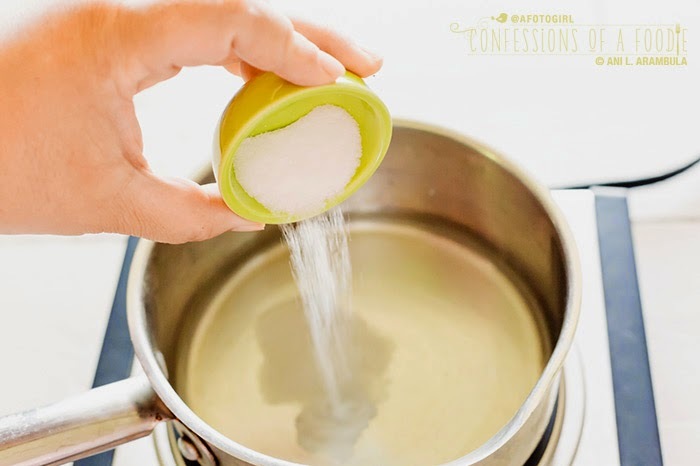 Stir the flour into the sugar water, cooking over low heat for one minute. Remove pan from heat and continue to mix flour until all the lumps are gone. This also acts to cool the flour mixture down a little so that it's easier to handle in the piping bag. Set aside to cool for five minutes. 3. Pour 1 liter of oil into a dutch oven or other large heavy bottomed stock pot. Turn heat to medium high to begin heating oil. 4. Place chosen tip in a large (preferably 16 inch) piping bag. 5. Spray a baking sheet with cooking spray. If using a large piping bag, add half the dough into the bag. If using a standard 12 inch disposable bag, place a quarter of the dough into the bag. Then pipe a 5 inch long line of dough directly onto the sheet, using a knife or your finger to cut the dough away from the star once desired length is piped. Repeat with remaining dough using a second sheet pan if necessary. 6. Line a baking sheet or large platter with paper towels; set aside. 7. Add sugar and cinnamon for coating to a shallow dish; set aside. 8. When oil has reached 325 degrees, carefully place one churro into the hot oil. Wait 30 seconds to one minute before adding another churro to oil and use a slotted spoon to keep the two churros from touching each other (they'll want to gravitate towards each other in the hot oil and if they touch, they'll stick to each other and you'll get one big blob of fried dough). Cook no more than three at time to ensure you can keep the churros from touching each other. Use a slotted spoon or large handled tongs to rotate churros in oil so they fry evenly on all sides. Fry for 3 - 4 minutes or until just golden all around (don't brown too much or you'll dry out the center). 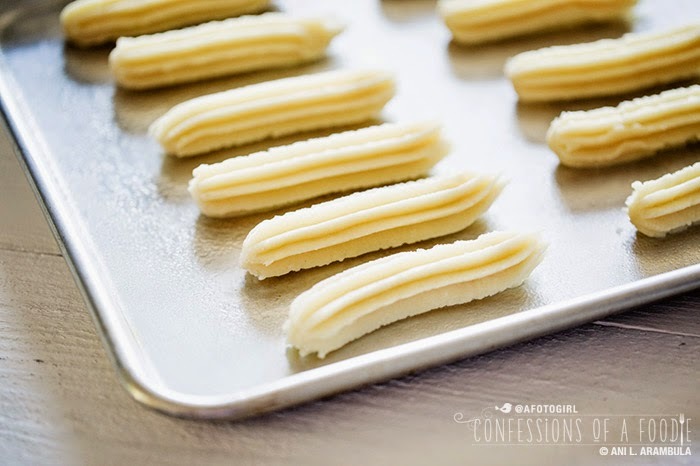 Remove golden churros to the paper-lined platter using tongs, holding the churros vertically over the pot of oil for a few seconds to drain off excess oil first. Allow to drain on the paper towels for 2 minutes then roll churros in the cinnamon sugar. Repeat until all dough has been fried and coated. 9. To make the sauce, place chocolate and cayenne in a bowl. Heat milk in a small saucepan to just before boiling. 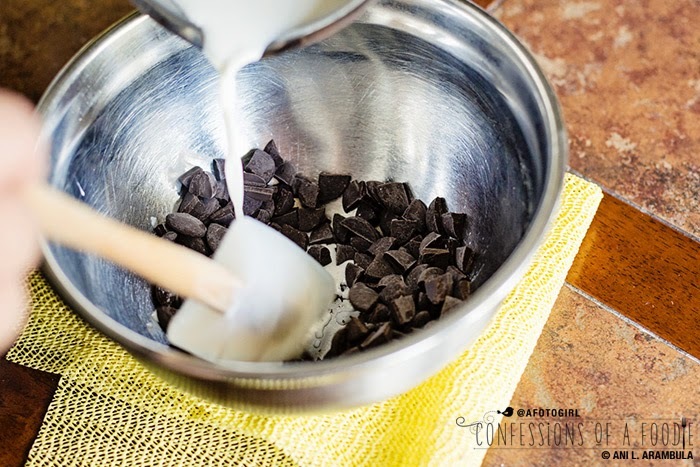 Add hot milk to chocolate and stir until chocolate has melted and is smooth and glossy. Place in a serving dish. Dunk churros and enjoy! Note: Allow oil to cool completely, they pour through a coffee filter lined sieve and return to bottle. Grapeseed oil can be re-used several times before disposing. I love this! I want to lick the computer screen! cannot wait to make these! Hi Dini! Welcome. :) These are truly delicious. I hope you do make them... Let me know what you think. what the nozzle tips you used?really nice form..
@Bella Bella, my recipe as printed here doesn't use eggs or butter which is a traditional pate a choux. 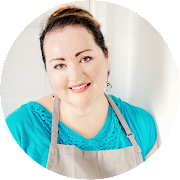 I have made churros with them and enjoy it but they aren't as chewy in the middle as I like so I use oil and no eggs which is often the way they are made in "poorer" households that can't afford eggs and butter. As for the lack of crispiness, not knowing what else you're doing I can only say that from my experience, when frying, if whatever you're deep frying doesn't come out crispy it's because the oil isn't hot enough. You want to make sure your oil is at least 2 inches deep in the pot. Heat it to between 365 to 375 degrees before adding the dough. Don't cook more then two or three at a time to keep the oil temperature from dipping. Make sure they are golden brown on all sides before removing them from the oil. 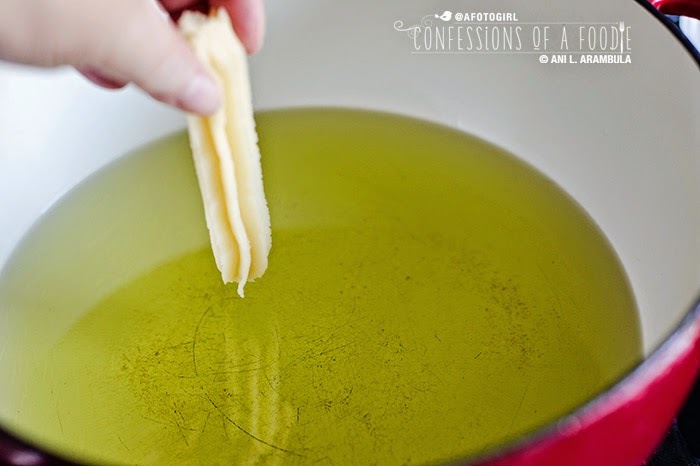 Use tongs or a wire mesh strainer (like a spider) or slotted spoon to remove from the hot oil to a paper towel lined platter to soak up excess oil. if you don't drain them on paper before rolling them in sugar they will not crisp up. Churros are also meant to be eaten soon after frying. Like french fries or anything else that is fried, the longer time they sit around after coming out of the fryer, the softer and limp they get. Fry up the churros and enjoy them within a 1/2 hour of cooking for maximum crispiness. Hope this helps! Wow. I need to try this. Definitely. I made churros with butter and egg just now but I don't really think that they have the right texture and taste. I hope this recipe is the one I am looking for. Thank you for sharing!